What does it mean to be a woman of God in the twenty-first century? How can Christian women be equipped to serve God in the family, in the workplace and in the church? Where can churches and ministries find affordable, quality training for women in positions of responsibility or with roles in teaching others? WSF is designed to help answer these questions by bringing together Christian women, from a range of church backgrounds and with varied life experiences to share and study together in Belfast Bible College’s unique setting. A typical Monday morning in WSF includes worship and prayer, three 45-minute sessions of biblically based teaching by our team of experienced tutors, and informal fellowship over tea or coffee. You will study six different subjects over the course of each year and in some of these modules you are encouraged to complete assignments that will help you develop your learning in more depth. The course also encourages you to apply your learning to service for God in every aspect of life and it is ideal both for women with lengthy experience of Christian service and those with relatively little. This course is only available to people in Northern Ireland. There are no formal entry requirements to this course. It is suitable for a range of abilities and experience. The WSF course consists of three years of study. 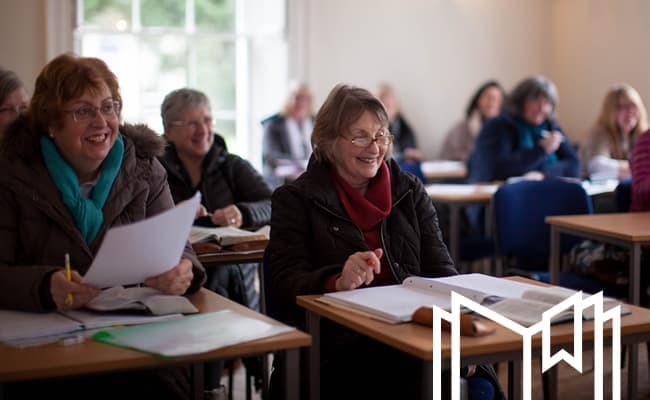 Completion of each year, with a minimum attendance of 70% along with the required assignments, leads to stage 1 of Belfast Bible College’s WSF Certificate. The three stages of the Certificate build upon one another, so that by Stage 3 (after three years) you will have a broad-based understanding of Scripture and Christian life. £380 per year. There is an option to set up a monthly standing order. You can enrol for one year and then choose whether or not to continue your studies, although most ladies stay for three years in order to benefit from the full range of training the course offers. We also recognise that life’s circumstances change, so if you need to take a break between years on the course you can put your study on hold for up to two years before returning to continue it. Closing Date for applications for 2018/2019 is 1st September 2018.